"It is my purpose to colonize persons of African descent, with their consent, upon this continent or elsewhere, with the previously obtained consent of the government existing there." "If we turn 200,000 armed Negroes in the South, among their former owners, from whom we have taken their arms, it will inevitably lead to a race war. It cannot be done. The Negroes must be gotten rid of." Ben Butler responded to this by saying: "Why not send them to Panama to dig the canal?" Lincoln was delighted with this suggestion, and asked Butler to consult Seward at once. Only a few days later, John Wilkes Booth assassinated Lincoln and one of his conspirators wounded Seward. Actually, Honest Abe brought up the slavery issue to gain sympathy only after he was losing the war. It worked, and the tide turned. However his true character is revealed in his words. "Mr. Lincoln was an infidel, sometimes bordering on atheism." "He never mentioned the name of Jesus, except to scorn and detest the idea of a miraculous conception." "He did write a little work on infidelity in 1835-6, and never recanted. He was an out-and-out infidel, and about that there is no mistake." In 1834, while still living in New Salem and before he became a lawyer, he was surrounded by a class of people exceedingly liberal in matters of religion. Volney's Ruins and Paine's Age of Reason passed from hand to hand, and furnished food for the evening's discussion in the tavern and village store. Lincoln read both these books and thus assimilated them into his own being. He prepared an extended essay--called by many a book--in which he made an argument against Christianity, striving to prove that the Bible was not inspired, and therefore not God's revelation, and that Jesus Christ was not the Son of God. The manuscript containing these audacious and comprehensive propositions he intended to have published or given a wide circulation in some other way. He carried it to the store, where it was read and freely discussed. His friend and employer, Samuel Hill, was among the listeners and, seriously questioning the propriety of a promising young man like Lincoln fathering such unpopular notions, he snatched the manuscript from his hands and thrust it into the stove. The book went up in flames, and Lincoln's political future was secure. But his infidelity and his skeptical views were not diminished. -- Herndon's biography of Abraham Lincoln titled The True Story of a Great Life. Why Did Lincoln Really Start the Civil War? Lincoln declared war to collect taxes in his two presidential war proclamations against the Confederate States, on April 15 and 19th, 1861: "Whereas an insurrection against the Government of the United States has broken out and the laws of the United States for the collection of the revenue cannot be effectually executed therein." - But there's a problem here. Georgia (and others) were no longer a member of that union. Technically Georgia was a separate country from the northern countries that formed the united states union. And the newly formed Confederate States of America was a new union of independent sovereign countries (called states). So Lincoln was invading a foreign country. The confusion occurs when people confuse the union with a country when in fact, the union is a union of countries (states). They don't teach this in sociology class (the class that replaced history class). It was on April 8, 1861, that Lincoln, alone, started the war by a surprise attack on Charleston Harbor with a fleet of warships, led by the USS Harriet Lane, to occupy Fort Sumter, a Federal tax collection fort inside the lawful territorial waters of South Carolina. Secession (withdrawal from a voluntary union), and war, are two very different events. The southern states peacefully seceded from a voluntary union, these united States of America and formed a new and more perfect union, the Confederate States of America. Lincoln, on the other hand, declared war against a foreign country, the Confederate States of America, because he admittedly wanted taxes from its component States for his Wall Street cronies that got him elected. As always, simply follow the money trail, not what they say. 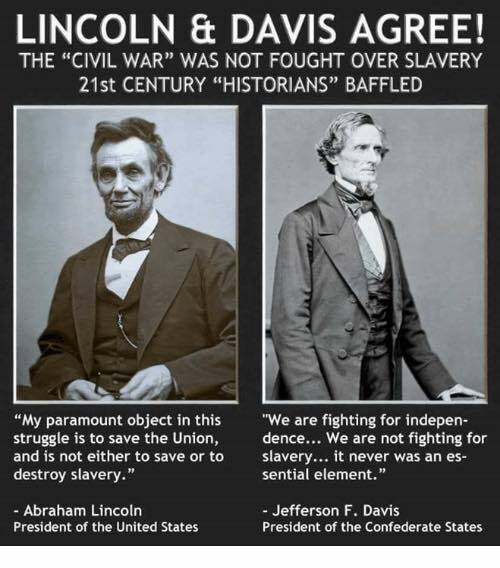 Honest Abe's Emancipation Proclamation did not free a single slave. Did you know that Abraham Lincoln practically imposed a dictatorship on the Northern states, closed down nearly 300 Northern newspapers, had thousands of Northerners arrested, invaded the Northern states of Maryland, Kentucky, and Missouri and took over their legislatures, all because those three sovereign states didn't want to participate in his war which they considered unconstitutional. The Writ of Habeas Corpus was suspended by Abraham Lincoln during the Civil War, during which tens of thousands of antiwar Northerners were imprisoned for voicing their views. Lincoln issued an arrest warrant for the Supreme Court Chief Justice when he correctly ruled that according to Article I of the Constitution, only Congress, not the president, could suspend the Great Writ of Habeas Corpus. Most Americans do not know that the American Civil War stated out as a kind of coup. While Congress was in recess the Lincoln warmongers had multiple provocations in the works to resupply and land troops in the Southern forts that were under a truce. At the time that was clearly an act of war. But their plan was to get the Confederates to fire on the resupply ships and then accuse them of starting the war. It worked very well. In the end Lincoln killed more Americans than Hitler and Tojo combined. Yet, he is still revered in the land of the free. The Red Chinese, when defending their treatment of Tibet, use Lincoln as their hero. Our press never reports that interesting twist over here. At the beginning of the Civil War, Lincoln and his little coup of Northern Industrialists wanted a nice short six month war to get them out of a depression. The federal government was dead broke and 10,000 businesses had gone bankrupt in the North. They had agreed to pull out of the Southern port forts and a truce was in effect. Confederate peace negotiators in Arlington, Virginia were assured that the North had no military intentions toward the seceded South. 'We just have some hot heads we have to contend with up here before we can do a non-aggression treaty'. To get the war started Lincoln launched multiple resupply missions to several of the forts, an act of war at the time, to get the Confederate States of America forces to fire on them which they did at Sumter in Charleston. Lincoln claimed that an innocent food supply convoy had been attacked. The archives showed they were landing troops, artillery and munitions. To this day we hardly ever meet a soul who knows this real history despite it's being right in our archives. It is rare to find a military officer, especially a Yankee, that knows that the loading manifests for the Fort Sumter ships have been open in the archives for a hundred years. They clearly show the troops and cannons on the manifests. But these inconvenient facts are ignored by the professional historians...it has something to do with hurting book sales. 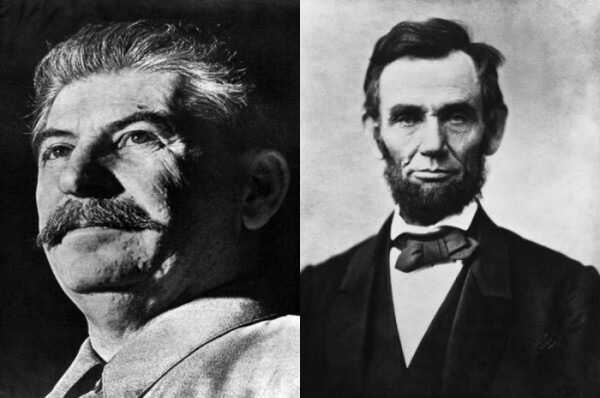 Lincoln killed more Americans than Hitler and Tojo combined. The war which began with the firing on Fort Sumter, April 12th, 1861, was a psyops, one of four put in play while Congress was in recess during the summer, by Lincoln and his Secretary of War Stanton. Washington knew the ships would be fired upon, and it could then be claimed that the South had broken the truce. The Gettysburg speech was at once the shortest and the most famous oration in American history…the highest emotion reduced to a few poetical phrases. Lincoln himself never even remotely approached it. It is genuinely stupendous. But let us not forget that it is poetry, not logic; beauty, not sense. Think of the argument in it. Put it into the cold words of everyday. The doctrine is simply this: that the Union soldiers who died at Gettysburg sacrificed their lives to the cause of self-determination — that government of the people, by the people, for the people, should not perish from the earth. It is difficult to imagine anything more untrue. The Union soldiers in the battle actually fought against self-determination; it was the Confederates who fought for the right of their people to govern themselves. And that, folks, is a brief, politically incorrect, observation of the indisputable facts. Thomas DiLorenzo is the author of The Real Lincoln, Lincoln Unmasked, and Hamilton’s Curse. Dr. DiLorenzo is today’s foremost critic of Lincoln. Dr. DiLorenzo is a professor of economics at Loyola University Maryland and a senior fellow at the Ludwig von Mises Institute, he has written for the Wall Street Journal, USA Today, the Washington Post, Reader’s Digest, Barron’s, and many other publications. He is widely published in the academic journals, including the American Economic Review, Economic Inquiry, International Review of Law and Economics, Public Choice, Quarterly Journal of Austrian Economics, and many others. He holds a Ph.D. in Economics from Virginia Tech. Was The War Between The States Fought Over Slavery? The Real Lincoln by Thomas DiLorenzo, Ph.D.
Lincoln Unmasked by Thomas DiLorenzo, Ph.D.
Rekilling Lincoln by Walter Kennedy, a revealing account of the man known as “Honest” Abe. Unveil the little-known dark side of America’s sixteenth president with this shocking biography. Using speeches and writings by the founding fathers, constitutional scholars, and even Lincoln himself, Walter Donald Kennedy lays out clear and convincing arguments that many of the cherished “facts” about the Great Emancipator aren’t facts at all! Surprising tidbits include Lincoln’s atheistic tendencies, friendship with Marxist leaders, and complete disregard for the constitutional legality of secession. Get ready to relearn the history of the president who shaped the United States of America into the nation it is today - for better or, as Kennedy suggests, for worse. "I have read DiLorenzo's books about Lincoln, and I was happy to find your web page summary of the man I refer to as the world's first fascist." This web page is not copyrighted. You may use anything on it without permission. Links to this page are appreciated. Thank you.